burgers with coke. or soon, a cab! Usually you chow down some White Castle after a rocking night of wine. Now, you might be graping it up with your slider. Full disclosure, never been a huge fan of the Castle. Their square patties weird me out and I’ve never loved the taste – Mickey D’s was always my jam. But they just announced that they’re testing having wine on their menu, with various wines going for $4.50 a glass. Other fast food places are becoming grapefriends too! Sonic is planning to sell wine and beer in two Florida locations. And four Starbucks in Seattle now sell wine and beer. They said they were going to sell local wines, but their offering is pretty broad regional: 3 from Washington State – King Estate, Chateau Ste. Michelle, Erath; 3 from California – William Hill, Joel Gott, Louis Martini; and then an Alamos (Argentina) and a Canella (Italy). 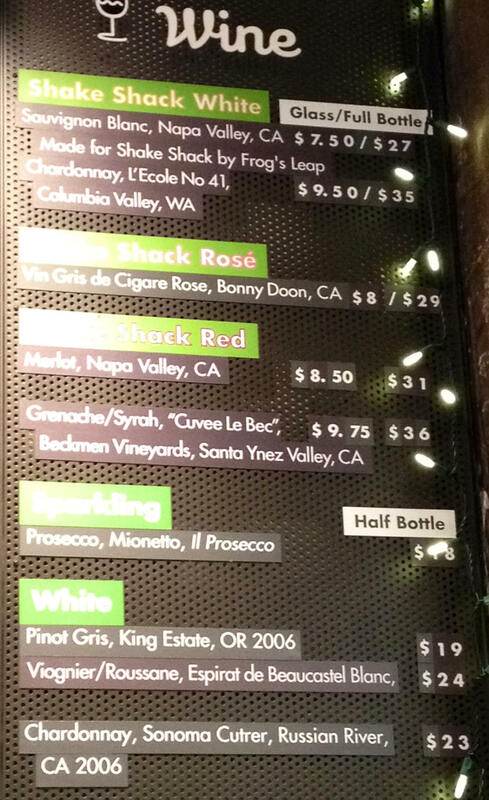 shake shack wine list - horribly bright pic but I was getting mean glares from the people on line! Shake Shack, the burger and shake place that people in NYC (minus me) will wait on an hour-long line for, serves wine too – and some are actually pretty decent! They’ve got a Bonny Doon Vin Gris rosé, a King Estate Pinot Gris, a Viognier/Rousanne on the list (interesting), and even a Sauvignon Blanc that’s made just for them. With a burger, however, I’d go for the Beckmen Grenache/Syrah (SS sells a bottle for $36 but it retails for about $16). Now, Shake Shack is run by Danny Meyer so that’s as upscale as fast food is gonna get. And Starbucks isn’t exactly a flipping-burgers joint either. But with this White Castle news, I think we’re officially infiltrating! Tags: harold kumar white castle starbucks shake shack selling wine rose pinot gris viognier grenache syrah. Bookmark the permalink.